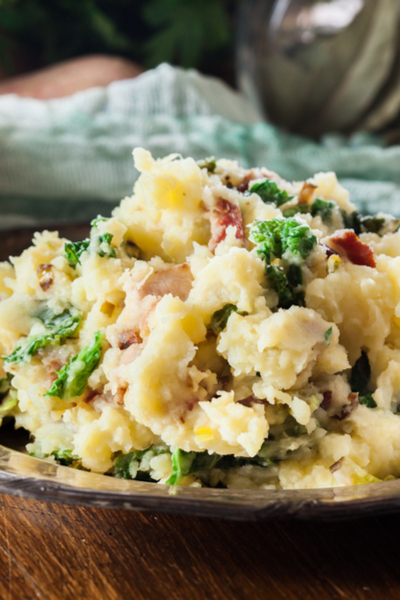 When it comes to popular Irish meals, Colcannon is usually one of the least known. Most likely because it is considered a side dish and not the main focus of a meal. Colcannon ready to be served. You may be more familiar with Bangers and Mash or Shepherd’s Pie. However, as you will see, this truly could be a full meal in itself. It meets all requirements, having protein, starch and vegetables as ingredients. Ireland was well known for growing potatoes. Because they were readily available, potatoes were served at almost every meal. But not always plain potatoes. Sometimes they were combined with other items such as pork or vegetables. And that is exactly what constitutes Colcannon. You see, colcannon translates into ‘white cabbage’ in the Gaelic language. Slice your cabbage or kale very thin for even distribution when mixing. Because cabbage was also very easy to grown in Ireland, when combined with potatoes, it became a very economical and hearty dish. But potatoes and cabbage don’t have a lot of flavor when cooked. So in an effort to make this dish more appealing, garlic, leeks and onions were added to the dish. But that’s not all. 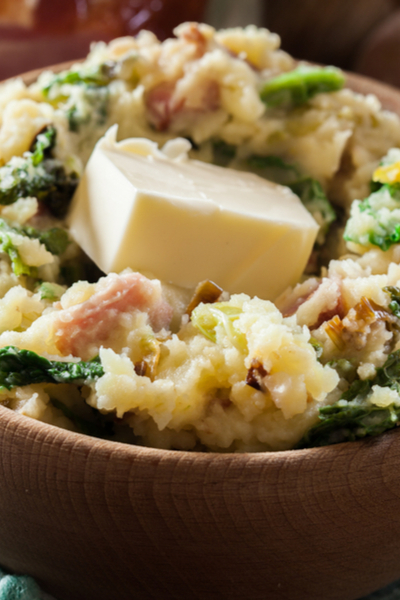 In the center of the serving bowl filled with Colcannon sat a large dollop of Irish butter. You can’t get much more flavor than that! 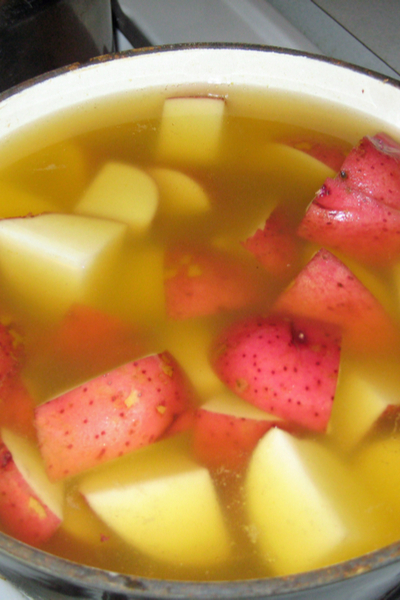 Boiling red potatoes in chicken broth gives this dish much more flavor. Colcannon isn’t just served on St. Patrick’s Day either! This dish was a must-make on Halloween in Ireland. It held special meaning to those that were single. In the bowl of the Colcannon were various charms that would signify what the future held for the finder. A button meant you would remain a bachelor, and a thimble meant you would remain a spinster for the coming year. 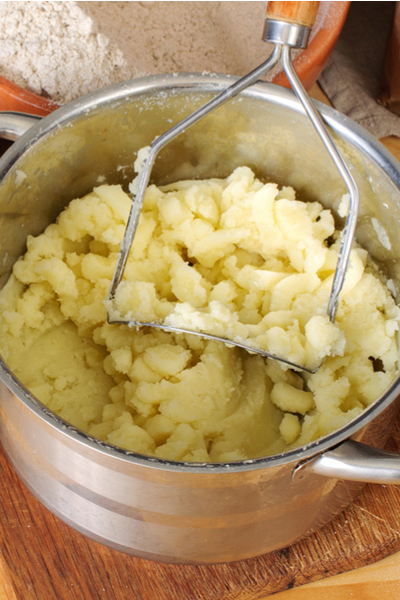 Use a potato masher, not a mixer, to make the best mashed potatoes. A ring meant you would get married, and a coin meant you would come into wealth. Although we don’t recommend adding non-edible items to your recipe, there are a few other variations that you can use. 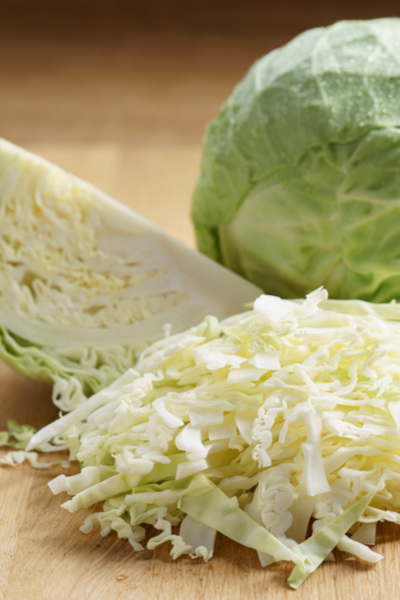 Although the original recipe calls for green cabbage, it is very popular to use kale instead. The bright green color of kale adds a lot of color to the dish. Once you have cooked your bacon, use the grease to wilt the cabbage. And instead of using onions, leeks or shallots are acceptable substitutions. As for the potatoes, any mashing potato will do. We used red potatoes here so that we didn’t have to take the time to peel them. Red potatoes have a very thin skin and mash easily when cooked. However, we also love the flavor and texture of Yukon Gold mashed potatoes as well. And of course you could use Russet potatoes. However, then peeling would be recommended. The best part of the dish – the addition of butter in the center. As for the bacon, we used classic American bacon in this recipe. 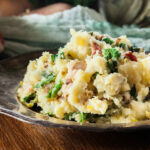 However, Irish bacon could easily be substituted in this colcannon recipe as well. Traditional Irish side dish of mashed potatoes mixed with sautéed onions, crispy bacon and sweet cabbage that leaves everyone satisfied. In a large stockpot, add the potatoes and cover completely with water. Add 1 tablespoon of salt to the water and bring to a boil. Cook until potatoes are fork tender (approximately 12-15 minutes). 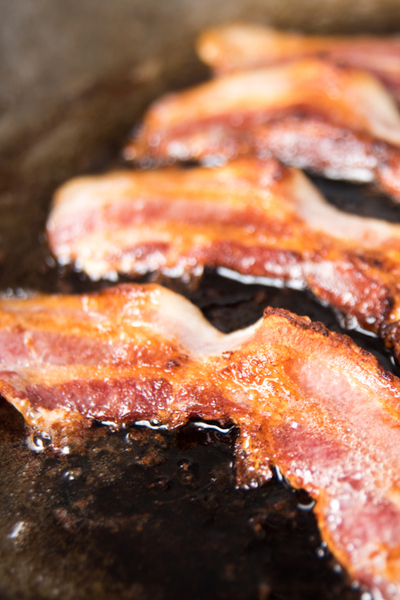 In a skillet over medium-high heat, cook the bacon until it is slightly crisp. Remove and drain on a paper towel. Reserve 1 tablespoon of bacon grease in the skillet and drain the rest. Add the onions to the hot skillet and sauté over medium high heat until they are lightly browned, approximately 2 minutes. Add the cabbage to the skillet and toss for about 5 minutes, until it wilts. Season with salt and pepper to taste. Turn off heat and set aside. Once the potatoes are fork tender drain and then place the potatoes back in the hot pot. Place the pot back over the lowest heat to help the remaining water evaporate off. Mash the potatoes, adding the milk, butter, salt and pepper. Crumble the bacon and fold in the bacon, cabbage and onions with the potatoes.